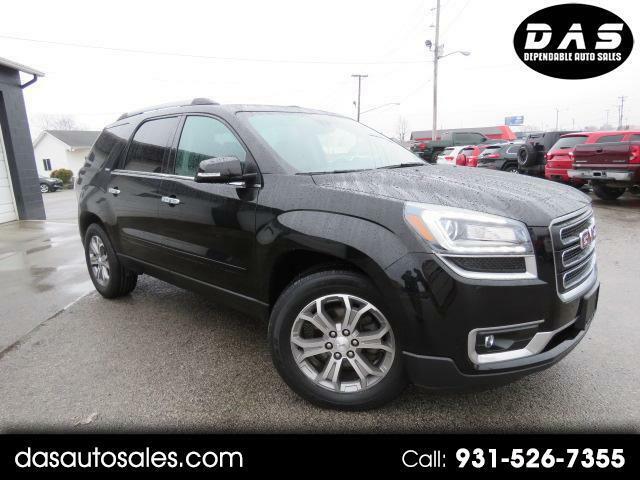 Our 2016 GMC Acadia SLT SUV in Ebony Twilight Metallic is an ideal blend of versatility, utility, and style! Our 3.6 Liter V6 generates 288hp and is paired with a 6 Speed Shiftable Automatic Transmission for easy passing. This combination delivers near 24mpg on the open road. Our Front Wheel Drive SUV will take you down the highway in ease and comfort with definitive lines and curves that depict the luxury in our incredible vehicle. Our Acadia SLT-1 is highlighted by 19-inch wheels and foglamps and has a bold stance that inspires confidence. Inside our SLT-1 delivers the upscale elements that you dream of, such as a backup camera, rear parking sensors, large sunroof, tri-zone automatic climate control, keyless entry and USB charge ports. Relax in heated leather front seats and enjoy the latest technology with a touchscreen display, OnStar, Bluetooth phone connectivity and a Bose sound system with CD, satellite radio and HD radio. With more cargo space behind the third row than any competitor in its class, a fold-flat third row with 60/40 bench seats and underfloor storage behind the third row, you'll have all the space you need for home-improvement projects or for all of the family's gear. You'll also have a myriad of safety features from GMC to keep you and your passengers as safe as possible. Anti-lock disc brakes, traction and stability control, and airbags will all provide you with peace of mind. Give your family the security, performance, and comfort that only come from owning an Acadia... Print this page and call us Now... We Know You Will Enjoy Your Test Drive Towards Ownership!